A significant drawback of wave energy converters acting as heaving point absorbers is the mismatch between the typical wave period and the natural period. This means that heaving devices have to be large in order to operate optimally in swell waves. 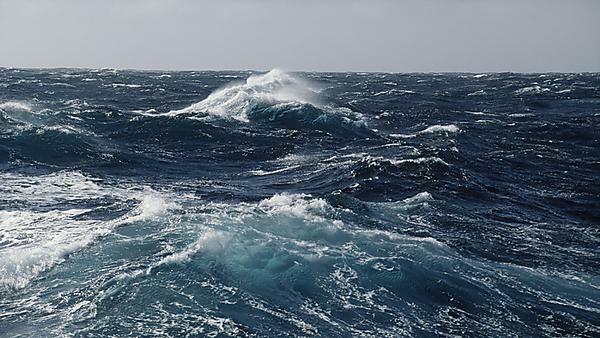 To overcome these limitations, control systems may be used in order to modify the motion response to suit the wave climate, but this can be complex and expensive. In this project, we investigate an alternative approach in which the device’s geometry responds to hydrodynamic loading. Many configurations can be conceived, but we propose to concentrate on a representative scheme, the “Squid”, sketched in Figure 1. As the device descends, the volume V1 of air inside the pressurised fabric bag is compressed. This forces air through a reversible flow (Wells) turbine into a second, rigid, container of volume V2. The flow is reversed as the device rises again. Since the device shrinks as it sinks, the resonance period is lengthened, so that a small Squid can be tuned to long waves. The heave period can be varied by changing the internal pressure and moving the equilibrium level up and down. The proposed project will assess the performance and optimisation of the Squid concept, by developing an optimisation tool using semi-analytical and numerical models and by performing a series of physical model tests. 4. Assess performance and optimisation of the Squid device and review the implications for other configurations using fabric.